Benchmark info has told us a lot more about the mysterious, gigantic 18.5-inch Samsung Galaxy View tablet. When Samsung outed the Gear S2 watch at IFA 2015, it briefly teased something called the 'View' tablet. We didn't know what it was back then, but now we do. A listing from the GFX Benchmark website outlines all the main specs of the upcoming tablet. 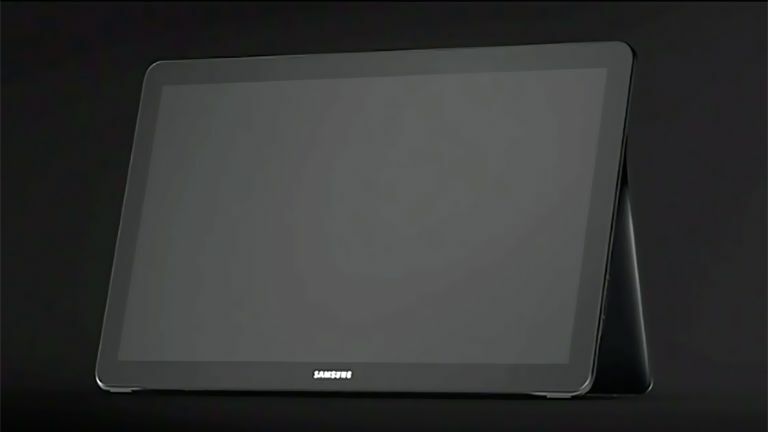 The real jaw-dropper is the screen, which measures 18.5 inches across. That's much larger than the 12.9-inch iPad Pro. The head-scratcher is that despite the gigantic display, resolution is just 1920 x 1080 pixels. A reminder: Samsung packs way more pixels into the 5.1-inch Samsung Galaxy S6. So is this is an affordable 'family' device? Perhaps. It only has one camera, a 2-megapixel selfie jobbie on the front, and the 2GB RAM is the least we hope for in a device running Android 5.1 these days. The Samsung Galaxy View's CPU is no weakling, though. The listing says it has a Samsung Exynos 7-series processor with eight cores. That's four Cortex-A57s and four Cortex-A53s. The GPU is a Mali-T720, a mid-range graphics brain but one that should be powerful enough to make any top 3D games run well at 1080p. Previous leaks suggest the View will let you use a Galaxy Note-style S Pen stylus and that it'll come with an inbuilt kickstand. Apparently we'll know the full story later this month. Who doesn't love a good mystery?